Susan Bassham tracks stickleback evolution. You can't sit in one place and watch evolution happen. But you might be able to come back after a while and see the evidence of it. 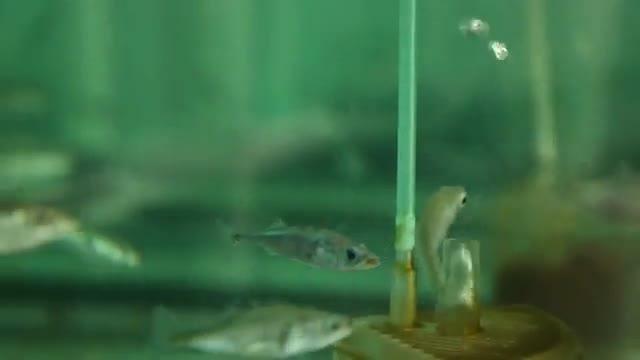 Stickleback, a little fish with big implications. And in a remarkably short time, it turns out. Scientists at the Institute of Ecology and Evolution at the University of Oregon discovered that the huge Alaska earthquake of 1964--the one that caused the Crescent City tsunami--forced sudden changes in a species of fish. UO biologist Susan Bassham visits with the details. Dr. Jon Peters talks about the huge evidence supporting evolution--and how he shares it. We are polarized about so many things, we often shy away from engaging in conversation with people who think differently from us. Prime example: evolution versus creationism. But suppose somebody brings up the subject and cites "facts" you know to be untrue... what do you do? Dr. Jon Peters is a physician who gives lectures on the evidence supporting evolution. Althea Rizzo talks about quake mechanics and preparation. It's not an anniversary anybody celebrated, and it certainly is not one anyone wants to re-enact. But January 26th marked 315 years to the day since the last big earthquake along the Cascadia Subduction Zone. Scientists tell us that time gap means Cascadia is due, if not overdue, for another major shaking. Oregon Emergency Management continues to warn of the likely destruction by such a quake.